In their April 2011 edition GLAMOUR magazine ran a full page ad (with coupons) for American Spirit cigarettes...as though this makes them cancer free or fashion forward! Despite a huge number of letters of objection sent to the editors, not one was published. 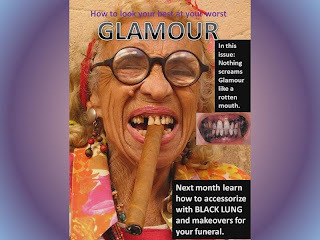 Later, with irony apparently lost on the editors, GLAMOUR even used a picture of a young woman smoking as a fashion "DON'T" in their fashion pictorial that runs at the end of every mag. Then, to confirm without question, their position: We don't care about the health of young women and girls who constitute a large part of out readership! They did it again! A full page ad for cigarettes was run in their August issue. So...having given GLAMOUR a more than ample chance to rectify their poor choices, and getting only canned, unsympathetic responses to letters to their editors, it is time for those of us who DO care about the health, welfare, and style of today's woman to take matters into our own hands. STOP your subscriptions! Encourage your friends to do the same! Let GLAMOUR know...We've come a long way Baby! You need to do the same. Check the GLAMOUR cover for the September issue at the start of this post! Toll - a tax or fee; a grievous or ruinous price. Melanoma has stolen much and exacted an incredible toll on those around me. The time and financial cost spent is something I don't even want to calculate. Work and friends and chores and commitments have been neglected. Friends have worried. Family members have been distressed. Brent has suffered incredible pain. My kids have born the burden in ways that have come to light immediately and in the more detrimental process as a weight over time. Since my diagnosis in 2003, when they were only 10 and 12, I have begged EVERYONE they were associated with to help them cope. I met with teachers and counselors, begging them to be a watchful, guiding presence for my children. Those near the sick patient can't risk admitting anger or fear very easily. Brent was great with them. But he was too close to the bone as well. I was desperate for help. And do you know? NOT ONE teacher or school counselor EVER talked with my children about their worries or concerns. NOT ONCE! Their pain goes on today. Stress and worry take a toll. Just recently Fred confessed that last year he had needed to come home from UT due to something that was going on with me. Planning ahead, he met with his professor before class and let him know that because of a personal matter, Fred would need to exit the class a bit early. The professor seemed OK with the situation, asked no questions, and led Fred to feel that all was fine. Yet, as Fred rose to quietly leave as planned, the professor loudly announced, "Well, Mr. Fancy Pants has decided he has more important things to do than attend class today." Fred replied as he kept moving toward the door, "Yeah, I do. My mom has cancer and I'm going to see her!" He reports that the collective gasp and following silence were deafening as he shut the door. Rose has suffered much with worries and doubts, letting things build up, as she tried so hard to be strong for others. It is a pain that I cannot erase or put a band aid on. Yet, much like a toll on a bridge, it does get you to the other side. We are all standing. We are all here, together. The kids are strong, kind people. We are honest with each other in ways that few people are. My friends and family who really have paid the toll with me, have come away from it...different....I think. Ruthie, bless her, is dealing with construction issues on her dream house with much more grace and calm than I could ever manage, shared with me the other day, "There have been nights when I lost sleep....over you maybe. But, I would NEVER lose sleep over a house or event or thing! I've learned that much, for certain!!" And so, despite the toll, those of us who paid, have learned much about life, ourselves, and others. Some of it hurt, but we are stronger and appreciate each other all the more. And to those of you who did reach out to my kids, with your phone calls, texts, emails, face book messages, visits.... It means more to me...and them...than you will ever know. Thank you.